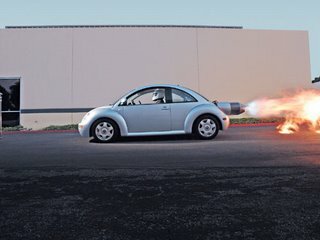 Unhealthy Obsession with Cars: Beetle Turbo...Jet! When a 180hp 1.8l turbo New Beetle Turbo S just isn't enough - you could follow the example of this guy profiled over at Wired. He took a 1350hp jet engine and mounted it to his New Beetle for some serious speed.